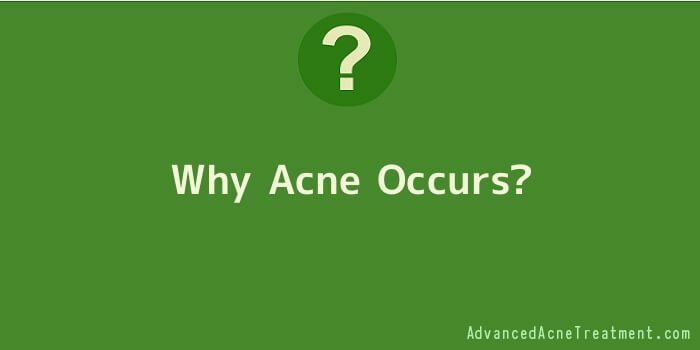 There are many different theories on what causes acne and, to some degree, they may all be right. The important thing is to gain some insight to what some of the contributing factors may be so that you can work to eliminate your own acne breakouts. You may have one or more of these factors behind your own acne breakouts. By understanding what these are, you can work toward finding the right solution for you. The Androgen hormone is the one most commonly tied to acne breakouts. Decreasing levels of this hormone, in both men and women, can often result in the reduction or elimination of acne. The thing to keep in mind, though, is that hormones can become unbalanced at various points in one’s life and this should be taken into consideration if you are not a usual victim of blemishes. Puberty is a time when our hormones initially go into overdrive, and the result is often teenage acne. You may also notice hormone imbalances and resulting breakouts during pregnancy, menopause and any time you take a medication or supplement that may alter the balance of your hormones. As with most ailments, acne can be traced back to genetics. If members of your family were prone to bouts of acne, you may be a more likely candidate for breakouts yourself. The good news is that this gives you a place to start for your research towards finding treatments that work for your acne. If you know someone in your family suffered from acne, find out that products and methods worked, or didn’t, to prevent or eliminate acne. Although a certain level of bacteria lives in the skin anyway, an increased amount can lead to breakouts. What happens, basically, is that the bacteria acts like a magnet to draw in white blood cells. The white blood cells, in turn, produce a cell wall damaging enzyme. The contents within the follicle respond by entering the dermis. The end result is inflammation, which causes various types of blemishes. At this time, though, it is not believed that the bacteria that lead to inflammations are contagious. 4. Can Stress Be Causing Your Breakouts? There are two main reasons it is believed stress may lead to acne and breakouts. The first thing to consider is that stress can cause a breakdown or weakened immune system. Once the immune system is weaker, it is more prone to infections and bacteria. The end result can be an increase in acne related breakouts. The other effect stress may have on the body that leads to breakouts, is inflammation. The heightened inflammation response breaks follicle walls, as what happens with increased bacteria levels. Alternatively, stress may heighten the level of androgen hormone produced, leading to breakouts. The most common psychological connection between this and acne is stress. It is believed that emotional stress can play a huge role in the tendency to suffer breakouts. The problem often becomes that suffering with acne breakouts can lead to a greater amount of emotional stress, which, as a result, leads back to an increase in the number or severity of acne problems. The process becomes a vicious cycle that can be difficult to discontinue. Some Other Possible Causes It is most common for teens to experience acne, though it can creep up or continue into adulthood. Most often, though, with teens, the breakouts occur as a direct result of the hormone changes happening within the body. Dietary issues may also cause blemishes. For different people, it may be different things. For some it is the high level of chemicals in processed foods; for others it may be elevated amounts of sugar, salts, oils or fats in other foods. Other things you put into your body can also trigger acne. Some people suffer breakouts as a result of a new type of medication. While this may only be an initial reaction, it may also last for the duration of the medication regimen. Or, you may be suffering from not getting enough vitamins into your body. Most commonly, a lack of vitamins leads to a weakened immune system, which, in turn, can cause breakouts. If you are struggling with acne, consider which one or more of these may be triggering your breakouts. Armed with this kind of information, you may be able to overcome your struggles and find ways to clear up your skin.